Road Runner Girl: Injuries are a Pain!!! Literally! 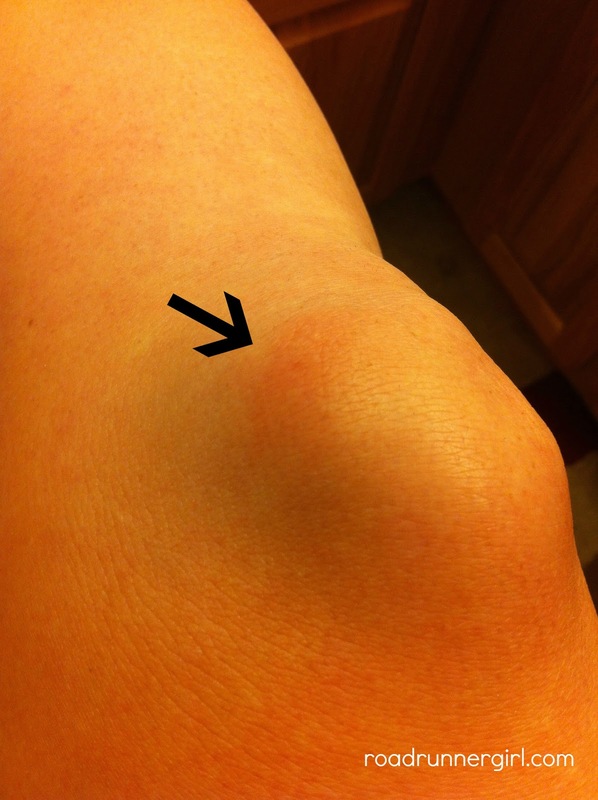 Remember when I told you about my knee starting to hurt on my 18 mile run a week and a half ago? Well, I rested all the next week so I could run my 10 mile long run the next (last) weekend. My knee felt better about two days after my 18 miler but I still didn't try to run. I had 10 miles scheduled for Sunday morning and didn't even think about my knee hurting...until I started running. I didn't even make it a quarter of a mile and I could start to feel it. But being a runner (we just don't stop do we) I kept running and made it my full 10 miles. No it wasn't horrible pain...just felt like my knee was bruised. And the run was awesome (other than the knee)! After the run I stretched, rolled, and iced my knee. I took Aleve for inflammation. And it was killing me. Still felt really, really bruised. The next day...same thing. It didn't feel any better. And the tears started flowing. Because I am realizing that I may be injured. And I'm frustrated. I only have 2 more really long runs (20 and 22 miles) left in my marathon training. The marathon is January 13th. And I was just starting to get my groove back and feel really awesome during my runs. And my hip that has been hurting since the beginning of October is feeling much better. And now this...another pain arises. WHY??? WHY now when I am so close to marathon taper time? 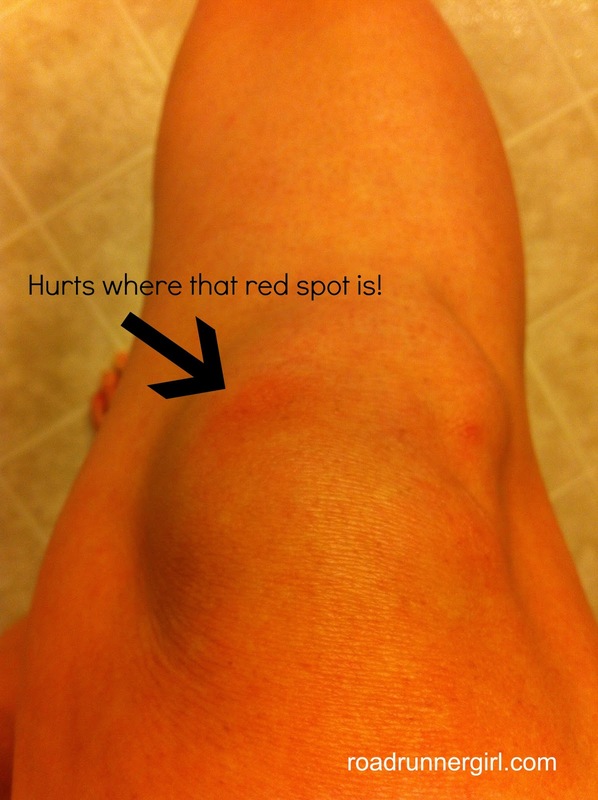 It's weird because the knee feels bruised and when you look at it there is a red area that has some heat to it and is where the bruised feeling is. My husband looked at it and said, "It's bruised." I took a few pictures but I'm not sure if you will be able to see the redness very well. After a couple of days the red area goes away. And it starts to feel better. But as I found out on Sunday...it will hurt again when I run. So far I haven't run any this week...because the knee feels a little better but is still hurting. This weekend I am supposed to run 20 miles. I know in my heart that I need to rest this weekend and NOT run the 20 miler. And that kills me. I REALLY want to run!!! But I also don't want to injure the knee worse and not be able to run the marathon at all. I'm hoping the rest will heal it. And I'm really praying that I will still be able to run my marathon on January 13th. Please pray for me too! I would greatly appreciate it! And you know I have to share a picture of myself after my 10 mile run Sunday (because I am a dork who likes to take self portraits apparently)! 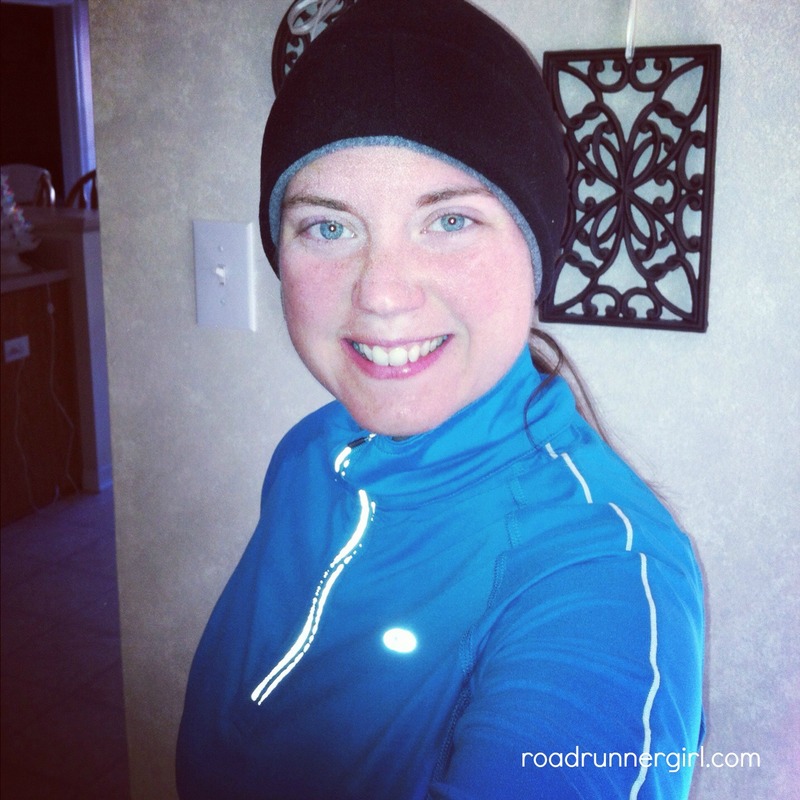 It was super chilly on my run so I was all bundled up!